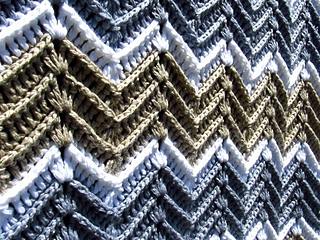 The stitch pattern was found on MyPicot – Crochet Textured Wave Stitch. 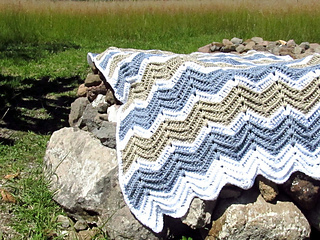 I put together the numbers, wrote the instructions for making the blanket and put a step by step photo tutorial at the end of the pattern to get you through the first three rows. 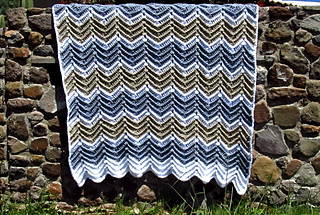 This blanket was very easy and interesting to make. The combination of basic stitches creates a very beautiful textured fabric. 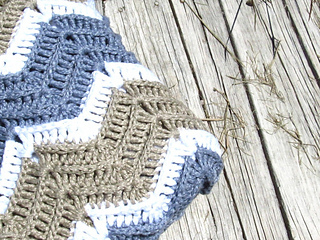 This is a perfect project for stash busting, as it allows you to work in multiple colors. I always love to have one simple project in progress that I don’t have to think about too much and can pick up any time during the day when I have a free minute. It is a perfect companion to watch a good movie! I was using three colors, but you can experiment with what your imagination and stash allows. 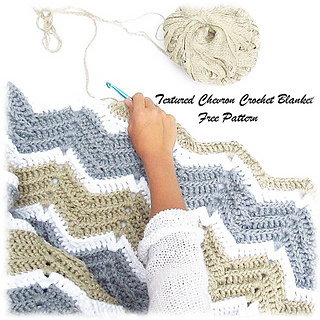 The blanket has a very rich texture which makes it perfect for working in solid color. You can choose to change colors every row, every other row or any color sequence you like. The exact gauge is not essential in this project. If you like the fabric in you swatch, but the pattern repeat doesn’t exactly match the gauge, you can either add or subtract one-two repeats depending what size you want your blanket. See the photo tutorial on the blog.